The RainSport 3 SUV delivers enhanced handling and gripping capabilities for maximum safety in wet conditions. Designed featuring Uniroyal’s innovative Shark Skin Technology, this tyre has a flow-optimised tread pattern to rapidly drain water away from the tyre resulting in excellent resistance against aquaplaning. Thanks to a specially designed tyre tread, the RainSport 3 SUV maintains optimal contact with the surface of the road for high levels of control when turning and a superb handling performance. The RainSport 3 SUV also achieves enhanced gripping capabilities thanks to the use of Fast Curve Configuration and flexible tread blocks which increase the area over which forces are transferred to the road. 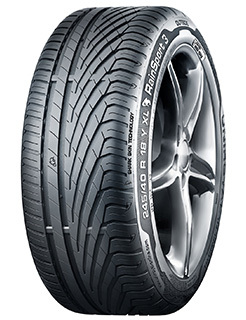 This enables the tyre to retain maximum levels of grip even when cornering.